I received an email a few months back about a new product called ChineseCUBES. I was instantly intrigued, as it was a novel concept, using blocks with Chinese characters on them with augmented reality. I’m definitely a promoter for new and exciting ways to learn languages, especially when it comes to using new technology. Augmented reality has been buzzing for the past two years, especially in mobile phones. I was curious how they will implement this with Chinese characters, so I got sent a copy to review. Here’s a short video provided by them on what it’s about. The first thing I noticed the amazing packaging and product design that went into ChineseCUBES. It’s not some cheap product shoved into a box, but it actually has a solid build and design. This gives off a very good first impression. You don’t get this in language learning products very often. When I opened it, there was a lot more than I expected: manuals, cd’s, whiteboard marker, character cardboard square (for writing on), a rectangle black pad to put the cubes on as well as a webcam. The addition of the webcam was quite surprising. I expected just to use my own webcam, but then I realized, some computers, mostly desktops, do not have webcams, so it was a needed addition. Now this is cool part of ChineseCUBES. 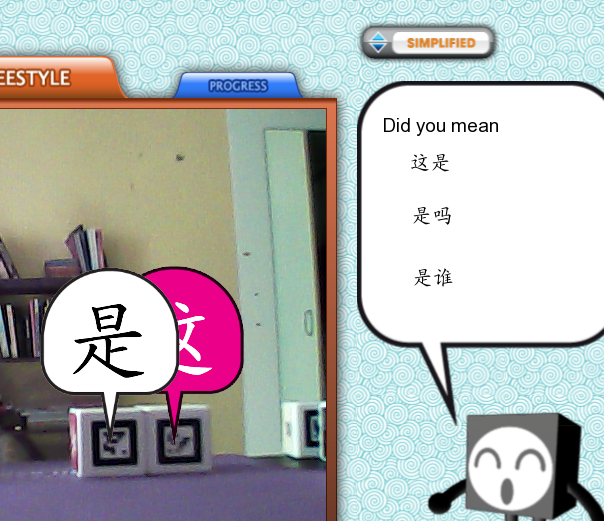 I’m used to doing most of Chinese learning online, so actually having physical objects present is a welcome change. It’s not just a book or CD, but webcams, cubes and pads. The webcam was a bit strange to figure out (I don’t think I’ve ever used a standalone webcam before). It magnetizes to the stand. At first I thought it might topple over easily, but it manages to hold quite nicely. The cubes themselves are also sturdy and lighter than I expected. 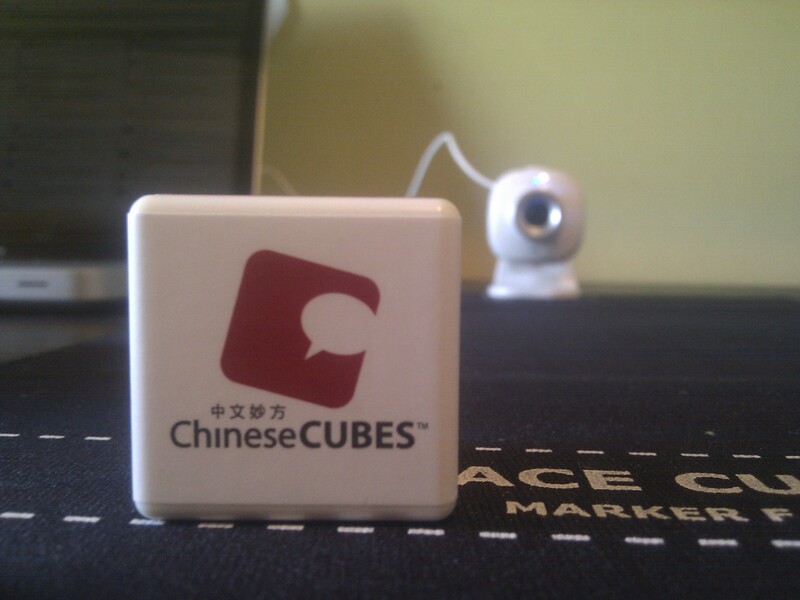 It’s hard to guess an appropriate size for the cubes, as there hasn’t been a product like this before. In any case, they don’t fall around and are not too clunky. The vast of amount cubes however becomes a bit confusing when you have them all on your table. The writing pen and square works fine with nothing really special. When it came to installing the software to use with the webcam, the process was a little convoluted. You had to install it via cd, which itself is a strange choice, as CDs are being phased out in new MacBooks and ultrabooks. I would rather have it been on cute cube USB stick than a CD. Then after installation you have register for an account on their website. With that account you can login using the software. I had some trouble with logging in once I created an account, because they asked me enter an “ID” with a password. I thought it was my username. After a few failed attempts, I realized they wanted my email address instead. After logging in you enter your serial number written on the CD case. Why can’t I just open the program and enter the serial number? What’s the point of having an account? Maybe there’s a reason for this. In any case after the installation, everything worked perfectly fine. Here’s the cool part. 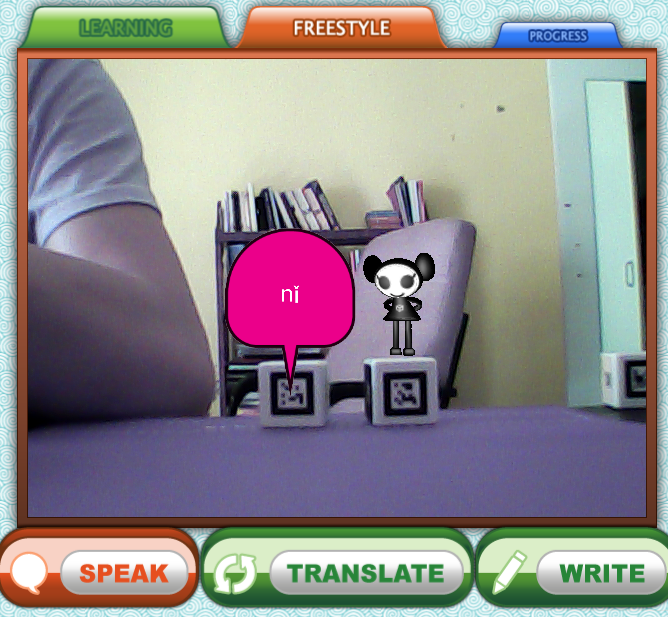 The webcam picks up the augmented reality tags on one side of the cube. On your screen the character pops up. When I first got the product I was skeptical that the augmented reality would be slow or iffy, but it works surprisingly well and is very responsive. Most of the time you would only have 1-4 cubes present on the screen, but I tested it with 15 stacked on each other. Every cube gets picked up and there’s no lag or crashing present. The software has two modes: Learning & Freestyle. In Freestyle mode, you get to just play around with the cubes. There are 40 character cubes available and then 5 Tutor cubes. 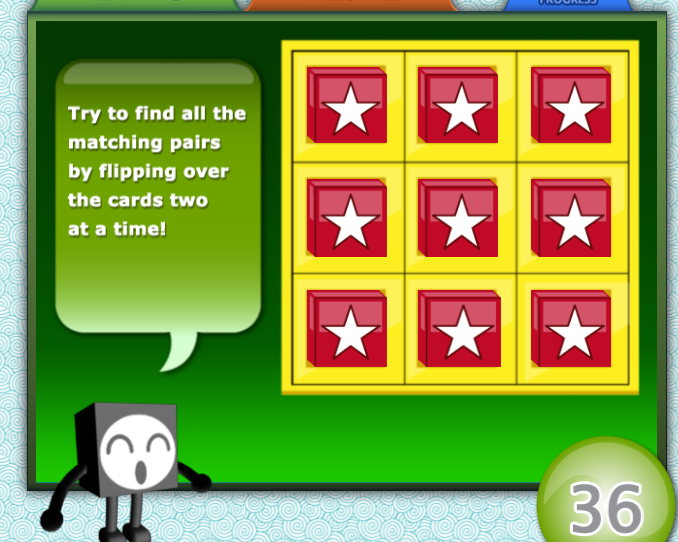 The tutor cubes is a great addition to the characters, because they activate an action on the present cube. The present cube is the last cube added to the webcam. 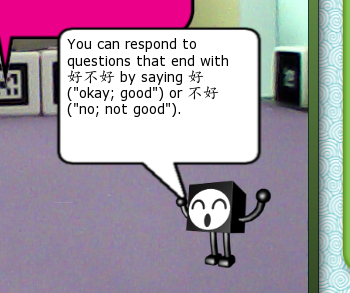 So for instance, when I place the Speak Tutor Cube, the program pronounces that cube and changes the character to Pinyin. A little avatar also pops up. You also get a Write Tutor Cube, which shows you how to write it, strokes and all. You can then use your marker and square cardboard grid to practice. Wipe it clean afterwards. Quite nifty! 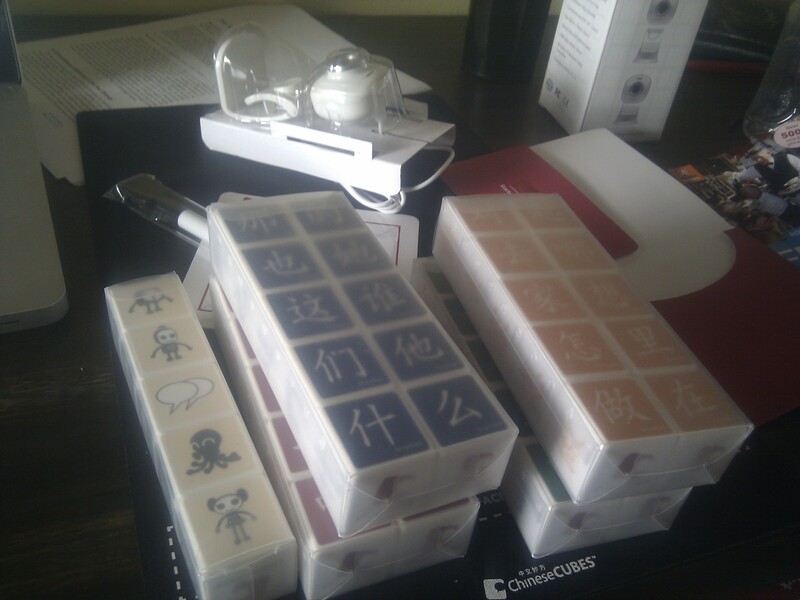 Then there’s the translation cube, copy cube and Fang Fang. The translation one is self-explanatory, but the copy one is awesome. When you place the copy cube next to a character it copies that character. So now you can write 谢谢 for instance. The Fang Fang cube is still a mystery to me. An avatar just pops up. Now here’s the cool thing. When you start putting random cubes together, the program starts suggesting words for you on the right side of the screen. If you do form a word, it connects the bubbles together. Just thrown down the speech cube, or translation cube for more info. It’s extremely fun. Like a puzzle mixed with exploration. With 40 characters there are quite a few combinations to keep you busy. This mode was a bit disappointing. It takes you on a step-by-step tutorial of each theme; that is the good part. It really explains why certain characters were grouped together in a theme. You end up using all of them in learning one “theme” of 10 characters. The guidance is great and the pop-up tips by Fang Fang (the main avatar/tutor) is good. However, they add these challenges to Learning Mode, which is basically just a Memory Match game. This feels pointless to me and definitely not a good way to test your knowledge. For some people this might seem nice and “game”-like, but it’s old and boring for me. I just end up clicking things until they match. There’s no skill and very little memory involved. Where the design in Freestyle Mode wasn’t really a big focus, the design in Learning Mode fell flat. It looked outdated, unpolished and unwelcoming. For example, see the challenge screen above. When you win a “coin”, there’s this terrible overly-flashy animation that’s played. At the end of a “theme” another type of challenge occurs, where a stimulus is given, such as a sound of word, characters or the pinyin. You have to choose appropriate answer when the carousel comes around. This again, is terrible user-experience design. When I look at the answer I sometimes take a split second too long. I then have to wait until the answer comes around again. Urgh. The content of the Learning Mode is great, but it’s presentation is not on-par with the rest of the product. The challenges can definitely be improved. Not all those words can be formed by the system, for instance words like: 做小 and 起见. However, ChineseCUBES doesn’t only work on dictionary entries. It recommended quite a few phrase like structures, such as 我是 and 好小 for instance. I’m extremely curious how they do this. It’s hard to say if the choice of 40 characters are the best option, but what definitely makes it worth it, are the themes they created around each group of ten. One of the questions I wanted to answer by using this product, was whether the augmented reality was just a gimmick or really added value? This is a hard question to answer as there aren’t really a lot of these products available. But here’s my opinion on this. I think the augmented reality does add value. The visceral connection between the cubes and your screen is something that is hard to explain. I thought, of taking away the screen and just having the cubes, then I realized, they are pretty useless. The fact that the augmented reality adapts to your interactions, especially with word suggestions in Freestyle mode, definitely enhances the interaction. If you just had the cubes, then there would not suggestions, no stroke order demonstrations, no instant popups and more. Thus, the augmented reality does add value. Could this experience have been replicated by just an online interface? Maybe, but having the actual cubes in your hands and playing with it, is something that cannot be replicated. I think the Learning Mode though fails in this added value: the physical cubes and augmented reality, could easily have been replaced by a tutor-like system explaining the characters and their combos. However, the idea of “themes” around 10 characters, is clever way introducing characters and their relationships to vocabulary/phrase formation in Chinese. It’s a pity that I could not have tried ChineseCUBES when I started learning Chinese. This would have allowed to place the review in context of its learning value. However, I think ChineseCUBES is a novel approach to teaching you your first 40 characters. The Chinese script is unique and the cubes translate this quite well, especially the isolating morphology. 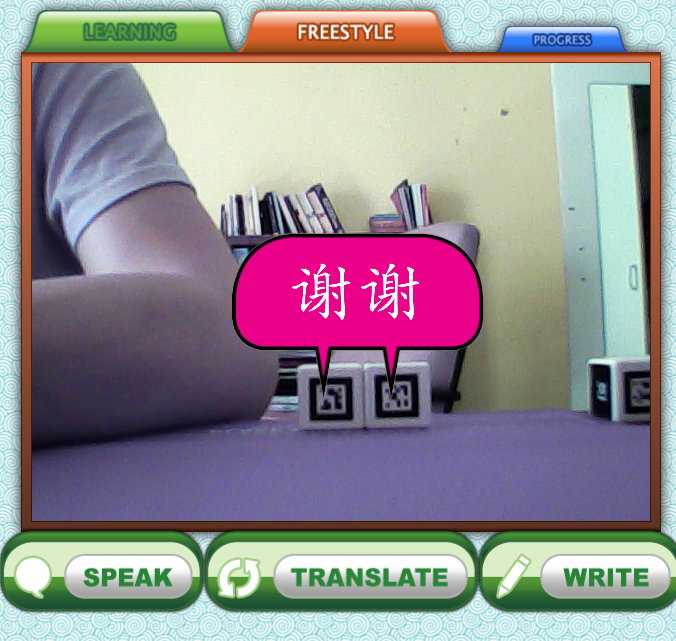 Playing with the cubes in Freestyle mode promotes curiosity and an understanding of how Chinese works. This is perhaps the biggest value that ChineseCUBES provide. I’m not sure how well you would be able to remember each word, or start using them in conversations, but it teaches the learner a unique meta-linguistic skill about the language itself, which I haven’t seen before. Oddly lacking is an introduction to radicals? Or their purpose as well. Therefore, ChineseCUBES, function more from the character-level up towards words and then phrase level. With a price of $149, it is a little bit on the steep side, but ChineseCUBES is a very unique learning product. An iPad app would not be a replacement. The Freestyle Mode is really something else, that can really just exist with Chinese and the way ChineseCUBES implemented it. The Learning Mode falls flat, but the content itself is not bad and quite novel. Beginner learners and Elementary learners would definitely benefit out of ChineseCUBES. Here’s the thing though, ChineseCUBES is not the most efficient and effective product out there. Skritter, Anki and other methods are definitely better, but ChineseCUBES fills a weird a gap between having fun, self-exploration, learning and introducing the learner to the unique aspects of Chinese syntax and vocabulary/phrase formation, which is definitely something that needs to be learned. I would recommend this to people just starting out in Chinese, while using other methods. Spend 10-20min a day with ChineseCUBES in Freestyle mode, and you’ll learn a lot of the way the language is structured while picking up new vocabulary. With that being said, ChineseCUBES is not a product that you need to use, as it does not easily fit in to the four strands of language learning. It’s a not a sustainable product, such as FluentU or Skritter that can easily fall into a language learning strand, to keep improving skills. ChineseCUBES, however, might fall into a strand of its own, which I discovered the other day on Leaky Grammar, called improvisation in language. It allows you to explore the language and improvise using the Freestyle mode, without any care or rigid rules to stop you. It’s unique and very engaging. If you’re frustrated and need a refreshing way to start learning Chinese, then ChineseCUBES will hopefully makes things a bit more clearer. Helps you learn the unique features of the Chinese language. 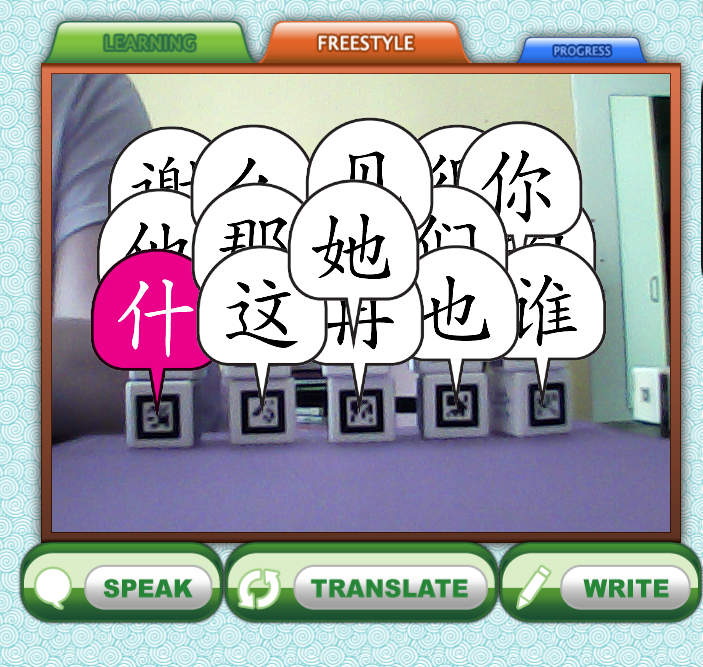 Freestyle mode and their recommendations is a great way to explore and start with the Chinese language.